Celtic manager Neil Lennon has been charged with breaking three Scottish FA rules for his conduct after his team's Scottish Cup semi-final loss to Hearts. The SFA's compliance officer, Vincent Lunny, issued the notice of complaint to Lennon for challenging referee Euan Norris's decision-making. Norris awarded Hearts a last-gasp penalty, which striker Craig Beattie scored to secure the win. Lennon was recently given a two-match ban for criticising ref Willie Collum. The Celtic boss has until 3 May to respond to the notice of complaint, the latest in a series of missives heading from Hampden to Lennon's office. The manager ran on to the pitch to confront referee Norris after the semi-final and Celtic's first-team coach Alan Thompson later confirmed that Lennon had been to the referee's room. Using his Twitter account later that day, Lennon ridiculed the penalty award and wrote that he believed some decisions awarded against his team were "personal". Lunny has charged Lennon with breaching SFA disciplinary rules 203, 68 and 71, relating to his conduct at the match, his use of Twitter to criticise the referee and acting in a way that is not "in the best interests of association football". 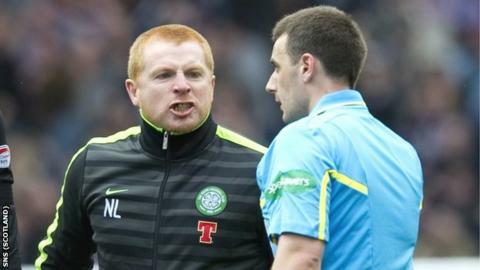 Lennon's two-match ban from the technical area, the second game of which is Sunday's derby at home to Rangers, was served for his criticism of Collum for denying Celtic a last-minute penalty in their Scottish Communities League Cup final defeat by Kilmarnock. And he was sent off by referee Calum Murray at Ibrox at half-time in a Scottish Premier League game on 25 March. The judicial panel tribunal "imposed no further sanction on the basis that the half-game served outwith the technical area was sufficient". The Northern Irishman has one charge outstanding for comments about the choice of referee ahead of a league game against St Johnstone. "Rule 203: No member of Team Staff shall commit Misconduct at a match, including but not limited to committing acts of the kind described in the Schedule of Offences in Annex C (including where there is aggravation by any factor, including but not limited to prolongation of the incident; combination of different offences; continued use of offensive, abusing and/ or insulting language and/or behaviour; calling a match official a cheat and/ or calling a match official's integrity into question; failure to comply with a match official's requests; adoption of aggressive behaviour towards a match official; any racist, sexist, sectarian and/or otherwise discriminatory element; and the degree of any physical violence), breaching the Post Match Protocol and committing Unacceptable Conduct. "Rule 68: No recognised football body, club, official, Team Official or other member of Team Staff, player or other person under the jurisdiction of the Scottish FA, shall in an interview, a 'blog' on the internet, on a social networking or micro-blogging site, or in any other manner calculated or likely to lead to publicity (i) criticise the performance(s) of any or all match official(s) in such a way as to indicate bias or incompetence on the part of such match official; or (ii) make remarks about such match official(s) which impinge on his character. For the avoidance of doubt this rule applies (i) whether reported to the Scottish FA by a referee for misconduct or otherwise, and (ii) where remarks are brought to the Scottish FA's attention, or of which the Scottish FA becomes aware, by whatever manner or means. "Rule 71: A recognised football body, club, official, Team Official, other member of Team Staff, player or other person under the jurisdiction of the Scottish FA shall, at all times, act in the best interests of Association Football and shall not act in any manner which is improper."